Nintendo has done quite well for itself this console generation, and its first party games like Wii Sports and Wii Sports Resort have sold like hotcakes laced with crack (but we don't talk about Wii Music). In a financial briefing for Nintendo investors, CEO and big boss Satoru Iwata unveiled Nintendo's next all-but-guaranteed money-maker: Wii Party. Developed as the next "marquee game" for Wii, Wii Party is exactly what it sounds like - a version of Nintedo's popular Mario Party titles, only with Miis. 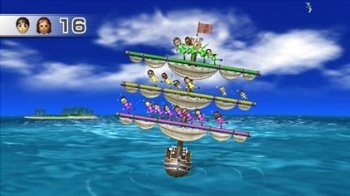 "In a sense, it is a natural move for your Miis and your friends' and family members' Miis to show up in a Wii party [game]," said Iwata, noting that the last major Party title was 2007's Mario Party 8. Judging from the very, very few screenshots available, it looks like exactly how you'd expect a "Mario Party With Miis" to look - interestingly enough, though, it seems the game board will be the Earth ... or at least one of them will be, anyway. Wii Party will be out in Fiscal 2010, and will sell roughly a hojillion copies.